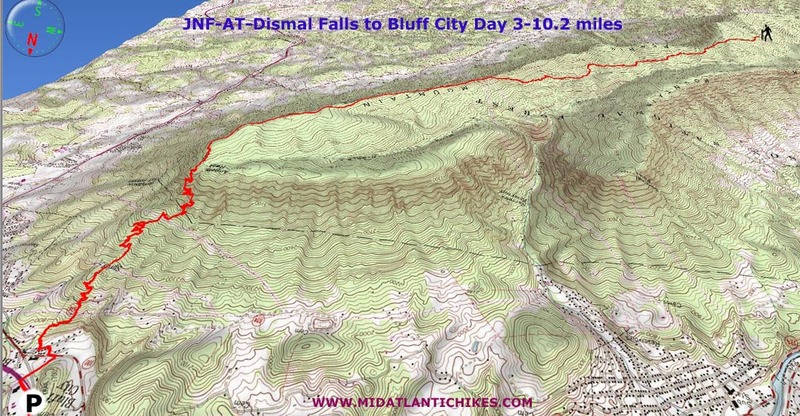 Description: Every year we look for a nice section of the AT to hike over a three day period. 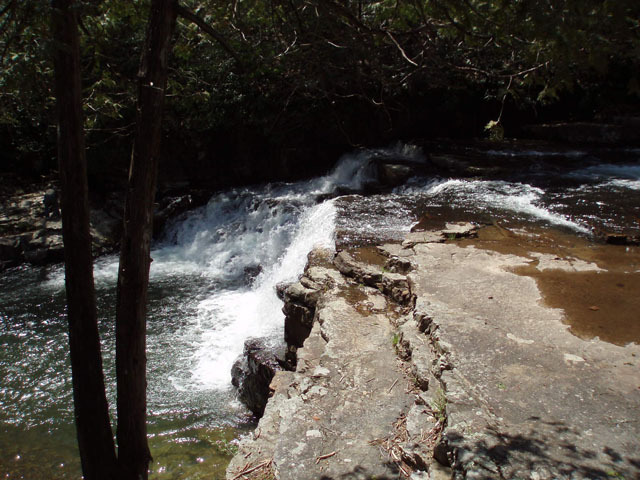 This one certainly fits that category with a nice waterfall, pretty creek, lush Rhododendron tunnels, towering White Pine groves, five vistas and lots of trail angels. The folks at both ends of this hike appreciate the backpackers that visit them on their journeys, whether through-hiking or just doing a section like we did. I'm sure even day hikers will get a helping hand should it be needed. 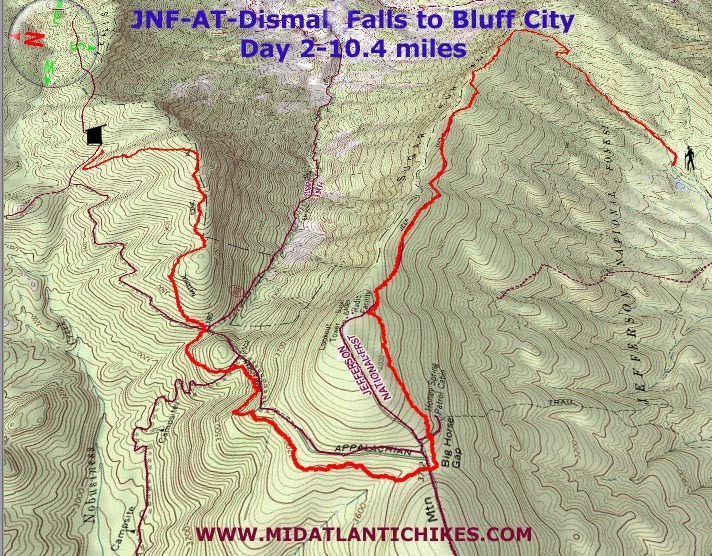 This is a moderate 30 mile trip with approximately 4500 feet of elevation gain (half of which is spread out over the second day). The mileages were chosen simply because of the location of the shelters. There are no really good places to camp in between. Call first to let them know. If you need help setting up a shuttle call Tina Muncey. She manages the Clover Dew Mart in Pearisburg. Call her at: 540-921-1943. Tell her Mike sent you. Trail Notes: As usual the AT is blazed with white paint. Side trails are blazed with blue. 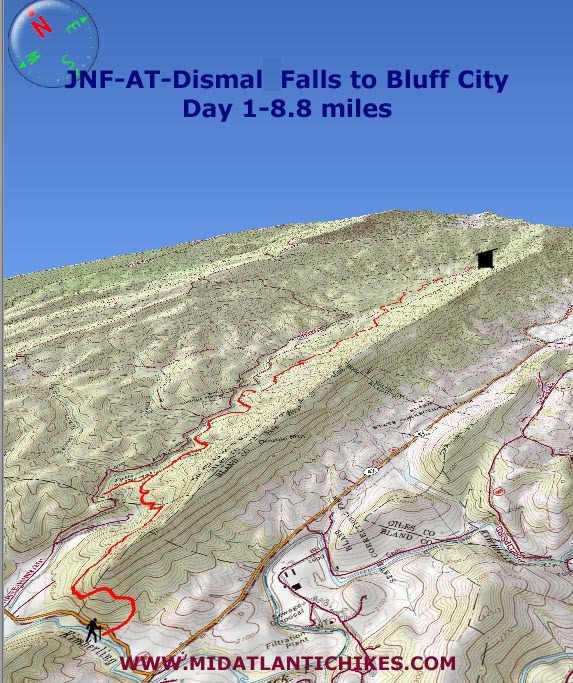 Day 1, 8.8 miles, 1300 feet E.G. : From Route 606/Wilderness Road begin a gradual climb up and over the gap of Brushy Mountain created by Kimberly Run. 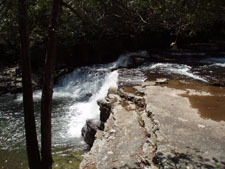 In 1.8 miles reach the blue blazed Dismal Falls Trail. Turn left and follow it to its end. After taking a break and a few photos return to the AT. 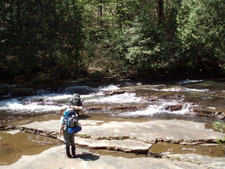 You�ll pass a nice campsite along the way. Turn left onto the AT. 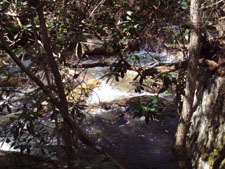 In 0.4, 0.8 and 0.7 miles pass potential, small campsites along the creek or one of its many tributaries. 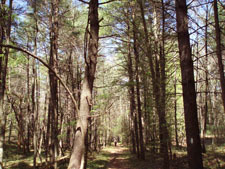 The trail climbs away from the creek, passing through two groves of giant White Pine. At 1.0 miles an old woods road comes in from the left. The trail descends for 1.2 miles and crosses a service road. 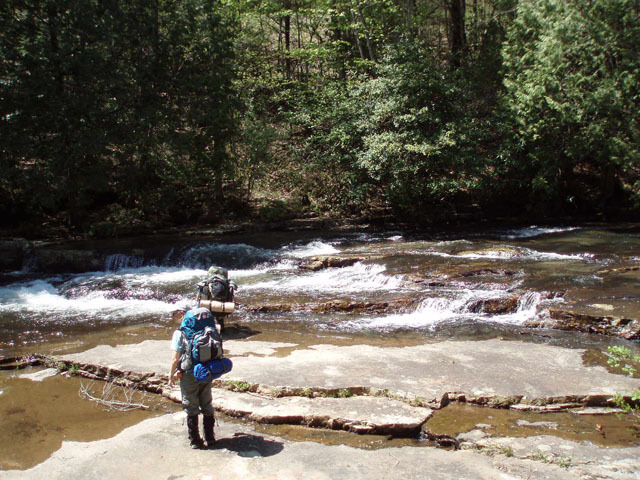 Cross the creek and in 0.2 miles from the road arrive at the junction with a dark blue blazed trail on the left. This trail has been partially blocked with branches. It is an old route of the AT and led to the original site of the Wapiti shelter. Both were relocated after the gruesome murder of two hikers in May, 1981. 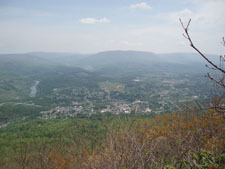 Continue on the AT. In 1.3 miles the trail splits. Stay right on the AT and pass an old pond whose dam had been breached. Arrive at the turn off for the Wapiti shelter in 0.9 miles from the split. There is plenty of room for tenting if you do not wish to use the shelter. Day 2, 10.4 miles, 2280 feet E.G. 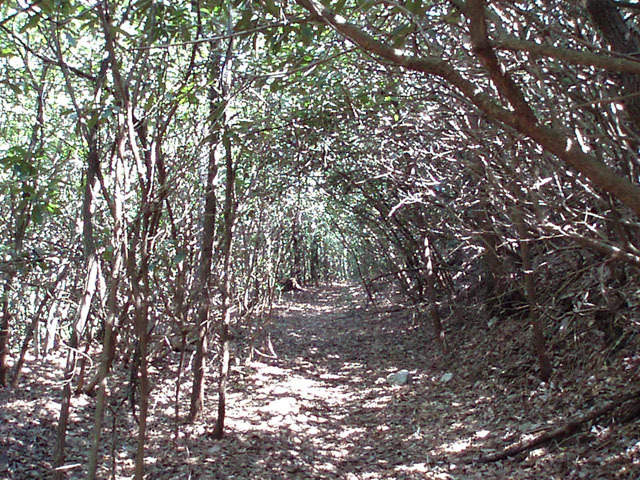 : You can either backtrack to the AT or continue on the blue spur that runs through the camping area to rejoin it. Turn right on the AT. After an easy warm-up along the creek begin a relatively steep climb. 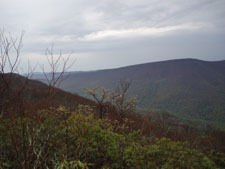 The trail will make a 90 degree left hand turn and reach the crest of Sugar Run Mountain. 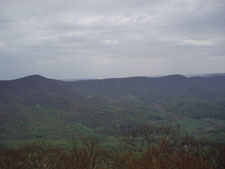 There is a great view of Wilburn Valley below and Pearis Mountain to the left from a rocky precipice on the right 3.0 miles after leaving the shelter. 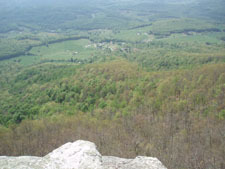 A keen eye might pick out the gap where your home for the night, Doc�s Knob Shelter, is located. From here the trail descends a bit to join an old haul road. 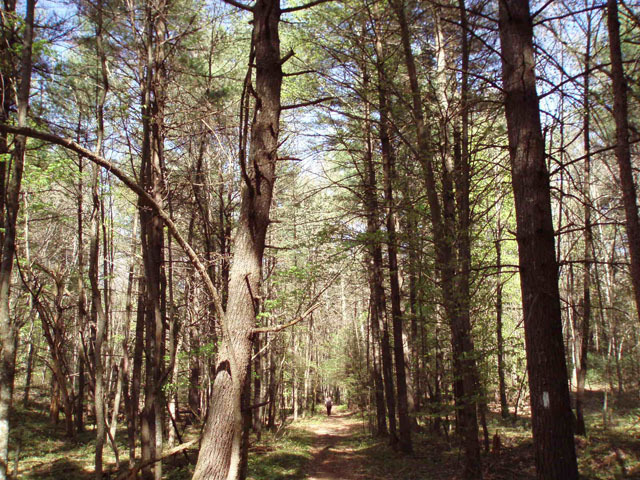 Enjoy easy hiking for the next 2.4 miles. The AT will then turn left onto a footpath to avoid a radio facility. Cross a woods road in 0.6 miles and then the tower access road in another 0.2 miles. 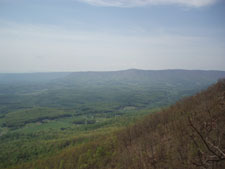 Here the trail cuts through a gap between Sugar Run and Flat Top Mountains. In 1.3 miles from crossing the tower access road cross another old haul road. Arrive at gravel Sugar Run Road in 0.5 miles. 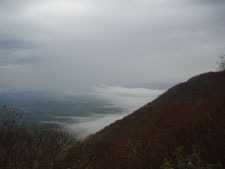 There is a hostel open during the AT hiking season about 0.5 miles down the road, heading east (to your right). The next 1.5 miles is extremely rocky. It reminds me more of PA than VA. You are rewarded with another view of Wilburn Valley just before turning left and descending 0.8 miles to Doc�s Knob Shelter. The ground is not very tent-friendly but if you look around in the Rhodies you will find a small piece of earth for your tent. Day 3, 10.2 miles, 911 feet E.G. : Right out of camp you continue on a pleasant old haul road, surrounded often by Rhododendron. 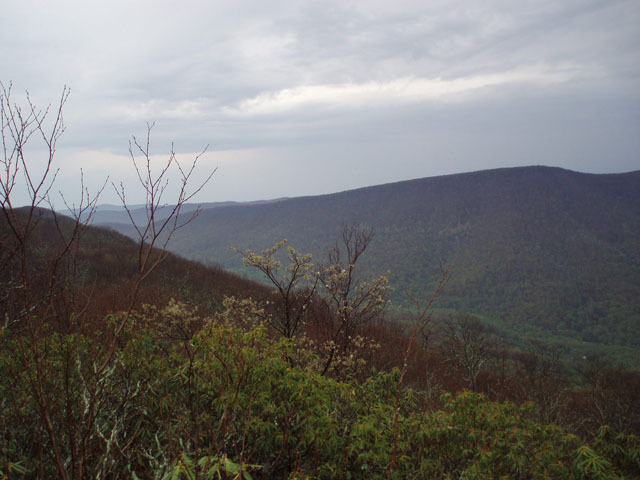 The trail stays below the crest of Pearis Mountain for 3.5 miles and then leaves the old road to climb up to a power line right of way, vista and dry campsite. The trail continues to climb but very gradually, reaching a miniature Tinkers Cliff in 2.2 miles. This is your last view of Wilburn Valley. 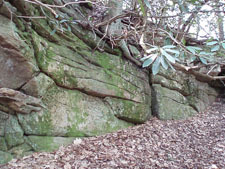 In 0.2 miles pass a blue blazed spur on the left that leads to a spring and possible camp area. 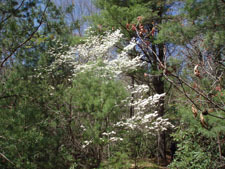 Most of the trees on this part of the mountain had been killed by some blight, perhaps Gypsy Moths. 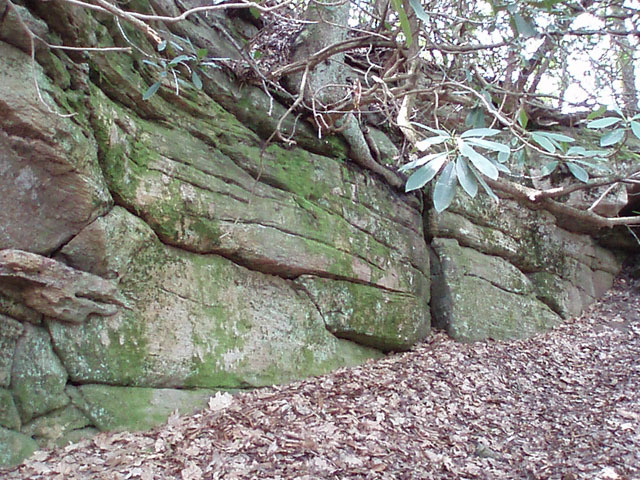 The trail descends through a rock city reaching the spur trail to Angels Rest in 0.4 miles from the spring trail. 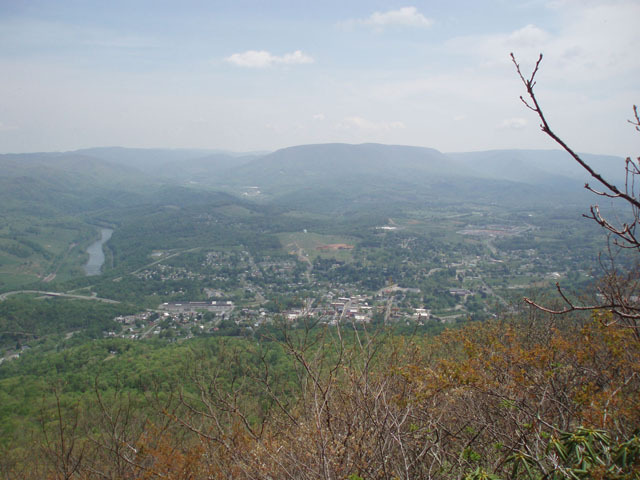 Besides the New River and surrounding mountains you can also see the towns of Pearis and Narrows. You might even be able to see your vehicle. From here the AT descends rapidly via a never ending series of nice switchbacks and stone steeps. 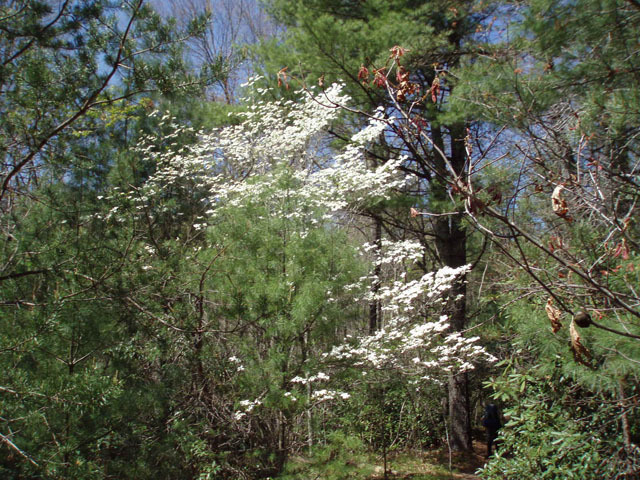 The trees are tall and the path is lined with wildflowers in the spring. Cross gravel Rt634 in 2.5 miles. The trail then turns left on a residential road for a few steps before turning right, passing through a grassy area with evergreens. Turn left onto Rt100 and then right onto Thomas Drive. Carefully cross U.S. 460. Turn left and follow the shoulder for 0.3 miles back to your vehicle.